...at special Introductory DISCOUNT Prices! 100% totally stable COTTON, that does NOT shrink! 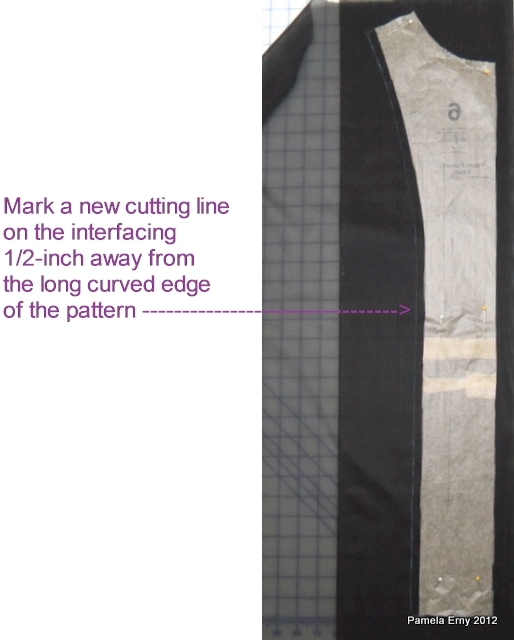 A medium crisp sew-in Interfacing that stays crisp. 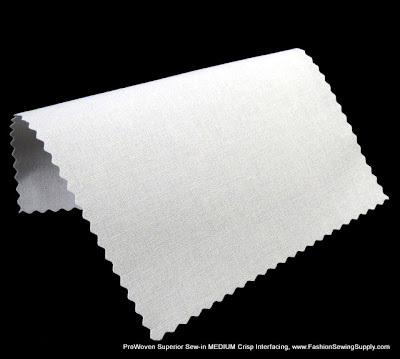 ...perfect for shirt collars/cuffs, and waistbands. 100% totally stable COTTON that does NOT shrink! 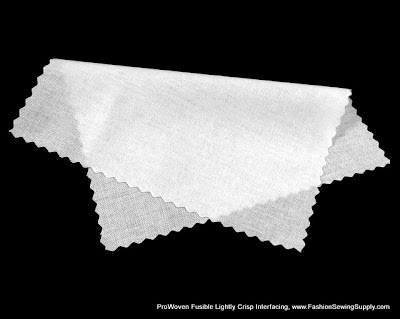 a Lighter version of our popular Shirt-Crisp Fusible. Ladies and gentlemen, Vogue 8800 is a winner! 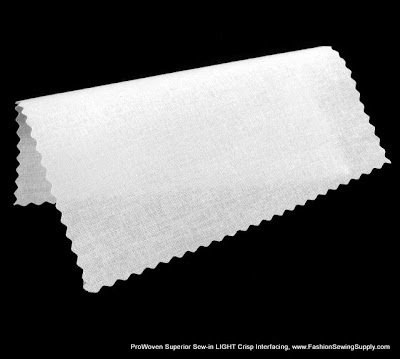 This is the pattern-- Vogue 8800. It is very straightforward...a simple style that is easy to sew. It is a slightly contoured (fitted) casual shirt, without being too tight. And the only alteration I had to make was to lengthen the sleeves. 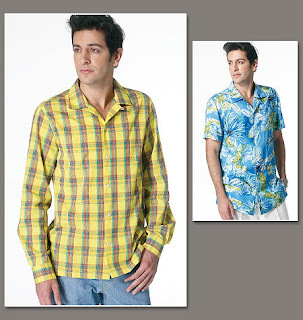 The short sleeves are quite short, which is a good look on a younger man. However in my opinion, too short for a middle aged man. I made this shirt for Roger in a size 40...he is a trim man in his mid-fifties. I lengthened the sleeve pattern by a full inch, and he still thinks they are a bit too short. So I advise to check the sleeve length before cutting. because the important drafting details are WONDERFUL ! LOOK... The collar is curved! 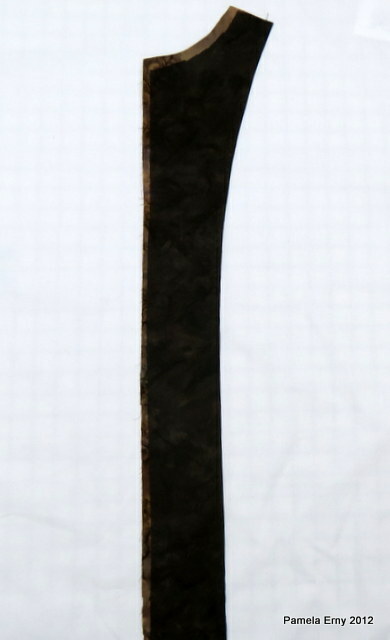 The yoke where it joins the back is curved! The back where it joins the yoke is curved! 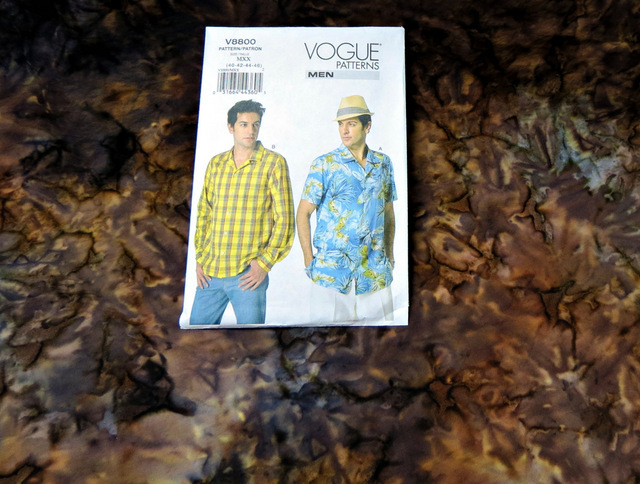 The 3 things I look for in a good shirt draft are all here in Vogue 8800. OK, so what if the instructions are basic. 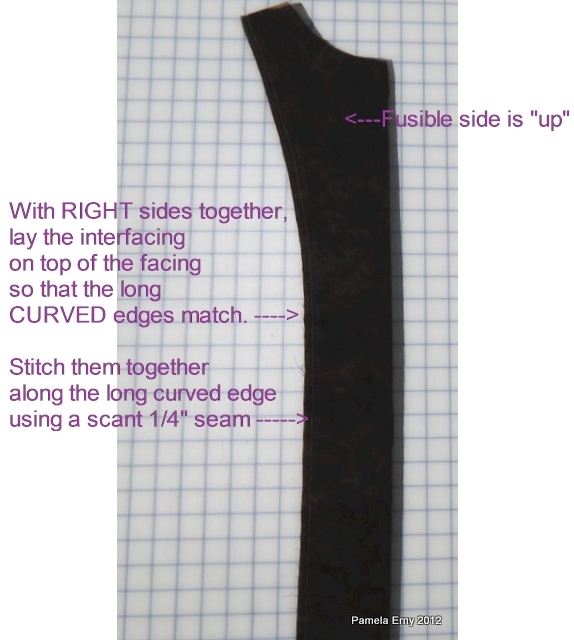 This is marked as an "easy" pattern, so I didn't expect the construction methods to be sophisticated. If we choose to do so...we can sew the yoke in a way that all the seams are enclosed, add a pocket from another shirt, and put slits in the side seams ourselves. Vogue has given us the most important thing...a very good draft! 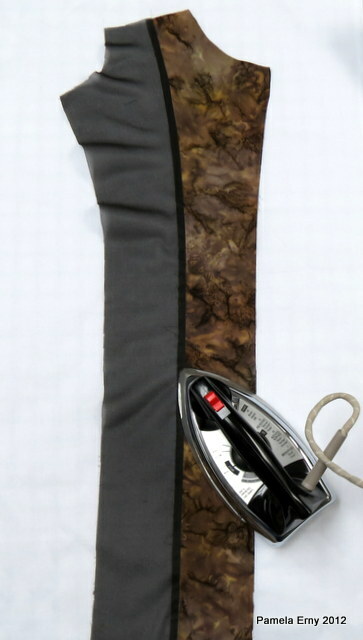 SEWING NOTES-- Pro-Sheer Elegance Fusible Interfacing and Textured Coconut Shell Buttons from www.FashionSewingSupply.com . Fabric is lightweight cotton batik. Next up, an evaluation of this fairly recently released Vogue pattern for a semi-fitted mens shirt. I get countless email messages asking me for recommendations for a "Good Man's Shirt". So when a new pattern comes out, I do my best to give it a try. Since most of the shirts I make are custom hand-drafted garments for clients... my husband Roger is usually the lucky recipient of these test shirts. 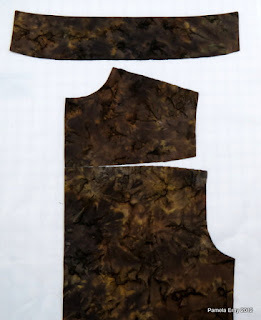 And since I really dislike to sew a muslin from actual "muslin", I am using one of the many batiks I have in stash, bought "on-sale-with-a-coupon-too." 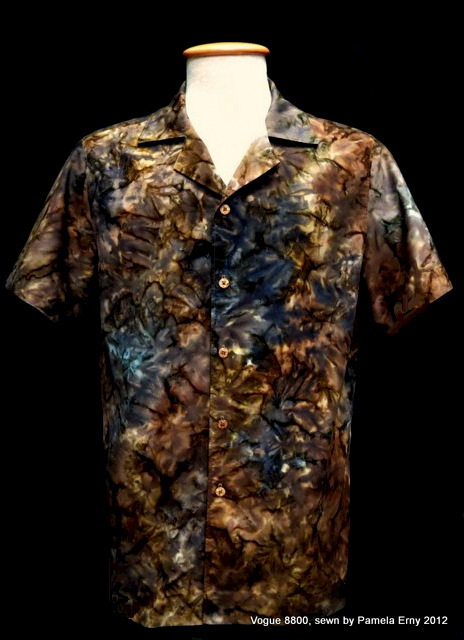 Yes, I am going to make the short-sleeve version in this marbleized batik. I think this fabric is one of those "in small doses" prints, don't you? A long sleeved shirt would just be "much too much" in this fabric. 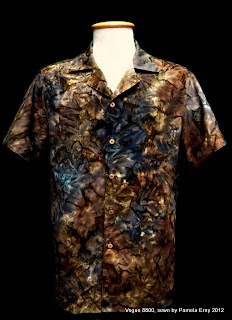 But I think a short sleeve version in this fabric will look kind of cool for a slim guy in his mid-fifties...we'll see. 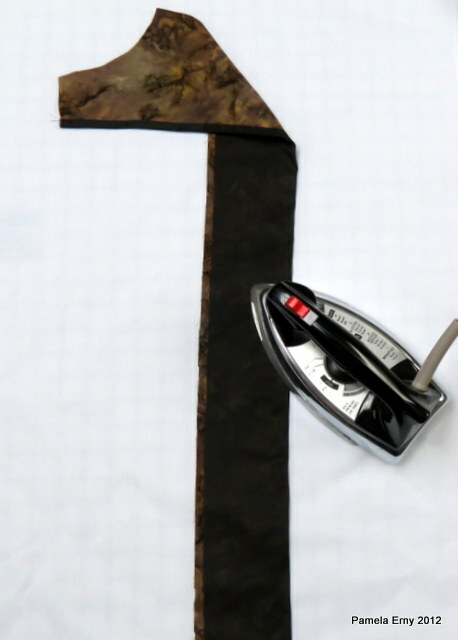 While sewing this shirt, I'll be evaluating many things such as the shape of the yoke as it relates to the back, the shape of the collar, the amount of ease in the sleeve cap and its height...among other things. This variation of my Wrap-Over Angled Yoke Shirt was cut and sewn in a more casual way than the first. It is less fitted and its slightly rumpled look is intentional. 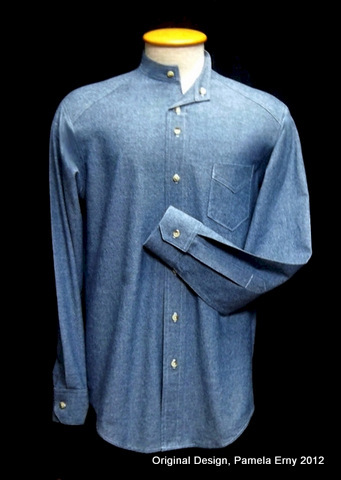 This shirt features angled cuffs, and a band collar that folds and buttons down on the left side. So...which of the Wrap-Over Angle Yoke shirts do you like more...this very casual one, or the more fitted version in checked fabric with piping I posted last week (see below)?